Attention parents of reluctant readers — this book is one you’ll want to put in your kid’s hands. It has all the draw of a comic book except the pictures. No fear there, though, Jon Lewis’ writing is vivid enough that pictures seem to spring off the page in full living color. As a certified reading teacher I have a good grasp of what kids will and won’t read. Alienation, is a WILL READ in capital letters. Don’t take my word for it though. Read what other people are saying here. After his parents were killed in a car accident, Colt McAllister was drawn into a world he thought only existed in comic books-one where mind control, jet packs, and flying motorcycles don’t even scratch the surface. As the alien invasions increase in frequency and force, C.H.A.O.S resources are taxed to the limit and they’re forced to utilize the new recruits. In the midst of battle, Colt will discover some startling revelations . . . about himself, his friendship with Oz, and why he has been chosen to defeat this alien attack against earth. Enter today by clicking one of the icons below. But hurry, the giveaway ends at noon on February 7th. 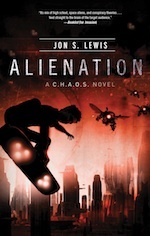 Winner will be announced at the Alienation Facebook Party on 2/7. Jon will be hosting an Author Chat, giving away copies of the books and gift certificates to iTunes and Amazon.com! Don’t miss a second of the intrigue! Don’t miss a moment of the fun. RSVP today and tell your friends via FACEBOOK or TWITTER and increase your chances of winning. Hope to see you on the 31st!